Second Edition. 6″ x 9″, softcover, 246 pages, Routledge. Social media has forever changed the way that people plan trips, take trips, and document a trip after their return. This change presents new opportunities for cities and towns to grow the local economy through tourism. Whether tourists come downtown to see historic sites and cultural venues, to attend business meetings, or to celebrate the holidays, the downtown area has a unique opportunity to capture much needed tourism dollars for local businesses. 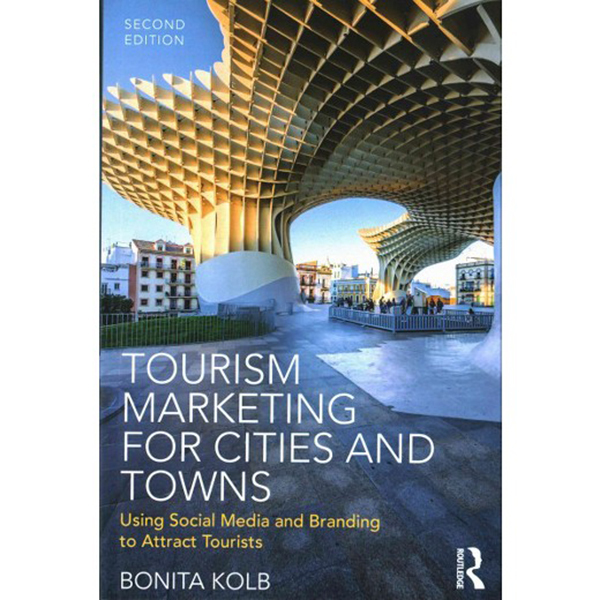 In this second edition of Tourism Marketing for Cities and Towns, author Bonita Kolb encourages readers to view tourism development as a community-based effort which fosters individual entrepreneurship, strengthens creative and cultural organizations, and enhances overall economic development. She outlines a process for involving local stakeholder groups, including business owners, nonprofit organizations, and community members in determining the unique tourism attractions that a community has to offer. Then, she turns her attention to researching current and potential visitors and how to reach them with social media and content marketing. This thoroughly researched book presents important ideas and techniques in a very readable format. Equally important, it puts the complex job of tourism marketing within reach for any community. Bonita. M. Kolb is an Associate Professor of Business at Lycoming College. She has written several books covering nontraditional uses of marketing, city and “place” marketing, and cultural marketing. Tourism Marketing for Cities and Towns is guaranteed. If you are not 100% satisfied, you may return it within 30 days for a full refund.